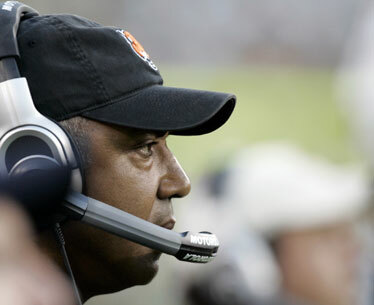 Cincinnati coach Marvin Lewis will have a new running back and right tackle this season. CINCINNATI » Offensive tackle Willie Anderson and running back Rudi Johnson lost their starting jobs with the Cincinnati Bengals during training camp. Now, they've lost their roster spots, too. Cornerback Deltha O'Neal, who also had lost his starting job, and linebacker Ahmad Brooks were among the players waived or released. Jeff Rowe was waived, leaving Jordan Palmer as the No. 3 quarterback. CINCINNATI (AP) -- Offensive tackle Willie Anderson and running back Rudi Johnson lost their starting jobs with the Cincinnati Bengals during training camp. Now they've lost their roster spots, too. "He has been significant to me. He has been significant to this organization, beyond me. We'll see what happens. It may not be over." The 33-year-old Anderson was the most tenured Bengal at 12 seasons. Injuries limited him to seven games last season, ending his streak of four consecutive Pro Bowl appearances. He became a backup to Stacy Andrews in training camp, and declined to take a pay cut to stay with the team. "This wasn't a decision based on my play, I want to make that clear," Anderson said. "They weren't comfortable with two guys making big salaries at the same position. I'm not mad or bitter about this, but I am disappointed in the timing." Lewis said the decision to release Anderson was "very tough." "He has been significant to me," Lewis said. "He has been significant to this organization, beyond me. We'll see what happens. It may not be over." The 28-year-old Johnson missed most of camp because of a hamstring injury, making him expendable. Chris Perry, a first-round pick in 2004, moves into the starting job after having a healthy preseason. Johnson ran for a club-record 1,458 yards in 2005. Hamstring problems limited him to nine starts and a 2.9-yard average last season. "I've seen Rudi practice very few times, and cut it loose very few times," Lewis said. "I thought he had a great spring and was doing everything, but unfortunately, he seemed to suffer from the hamstring." As expected, Tampa Bay cut Chris Simms, their former starting quarterback, who missed all of last season after a serious spleen injury and asked to be released. They also cut Ryan Nece, a former starter at linebacker. Atlanta released quarterback Joey Harrington, the third overall pick in the 2002 draft by the Lions and a starter in 10 games for the Falcons last season. Harrington had been third on the depth chart behind rookie Matt Ryan, the third overall choice this year, and Chris Redman. And there were actions in addition to the cuts. Kevin Faulk, the veteran third-down back for the Patriots, was suspended for one game and will forfeit two paychecks, the result of a no contest plea in July to misdemeanor marijuana charges in Lafayette, La. Faulk had been issued a summons for possession of marijuana at a Lil Wayne concert in February. The same penalty was leveled on Baltimore cornerback Derrick Martin. According to a police report, Martin was cited and charged in July with possession of three small bags of marijuana at the Cleveland airport during a random TSA screening while attempting to board a flight. And veteran running back Jesse Chatman, now with the New York Jets, was suspended for four games for violating the league's steroid policy. The New York Giants signed 44-year-old John Carney while Lawrence Tynes recovers from a knee injury, meaning they will have two kickers on the roster. They also kept just two quarterbacks, Eli Manning and David Carr, placing Anthony Wright on injured reserve with a back injury and cutting rookie Andre Woodson. Pittsburgh placed backup quarterback Charlie Batch on injured reserve. He broke his collarbone in the exhibition opener, and the Steelers signed veteran Byron Leftwich to take his place. Tennessee cut Roydell Williams, the Titans' co-leader in receptions last year, after he struggled to recover from breaking an ankle days before a playoff game in January. He had 55 catches last year along with Justin Gage, who signed a contract extension in February. Philadelphia released defensive end Jerome McDougle, a one-time first-rounder plagued by injuries on and off the field. The Eagles also released veteran defensive tackle Montae Reagor and tight end Kris Wilson. The Redskins cut punter Derrick Frost, choosing to keep sixth-round draft choice Durant Brooks. Among the other veterans let go by Washington were wide receiver Billy McMullen and offensive tackle Todd Wade, who spent four years with Miami and two each with Houston and the Redskins. Baltimore cut quarterback Casey Bramlet, signed last week as insurance when Troy Smith was ill and Kyle Boller injured. The Ravens also released special teams ace Gary Stills. Houston, which made most of its cuts on Friday, placed running back Chris Brown on injured reserve with back problems. That leaves the Texans with Ahman Green, Chris Taylor and rookie Steve Slaton. Drew Henson, the former Michigan quarterback and New York Yankees prospect, was cut by Detroit. He signed last week when quarterback Drew Stanton injured a hand. Also, Minnesota placed safety Michael Boulware on injured reserve. Boulware apparently injured a wrist Thursday night in the final exhibition game. San Francisco released underachieving receiver Ashley Lelie, who was going into the second year of a two-year, $4.3 million deal that included a $2 million signing bonus. The former Hawaii receiver had just 10 receptions for 115 yards last season while struggling with injuries. AFC champion New England released quarterback Matt Gutierrez and kept Matt Cassel as Tom Brady's backup for a fourth season. Cassel's roster spot appeared to be in jeopardy after he failed to lead the Patriots to a touchdown in 17 series during their winless exhibition season. Other noteworthy Patriots cuts were veterans Fernando Bryant, their starting cornerback for most of the exhibition season, and Victor Hobson, a linebacker who spent all five of his NFL seasons with the New York Jets. Carolina placed star receiver Steve Smith on the reserve-suspended list while he serves a two-game ban for punching cornerback Ken Lucas during training camp. The Panthers' veteran cuts included safety Terrence Holt and defensive end Stanley McClover, while cornerback-kick returner Ricardo Colclough was let go hours after he was arrested and charged with driving while impaired.